I get back from a 6 week trip where all I've done is complain that there was too much lager and what do I choose to review first when I get back home? A Lager. Figure that one out! Anyway, Serengeti is the national beer of Tanzania. Tanzania is a country in East Africa which borders the other great beer drinking country of the region, Kenya. 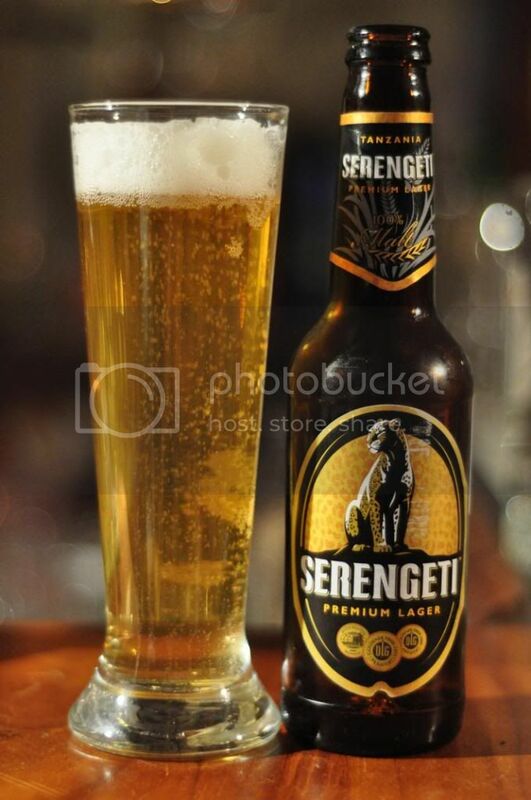 Kenya's East Africa Breweries actually owns the Serengeti brand, which is very popular in Tanzania since it's relaunch as a 100% Malt Lager in 2003. When cracking open a Serengeti I was treated to an impressive fizzing noise of carbonation. The beer pours a lovely straw golden colour with plenty of carbonation bubbles rising to the surface. The head was a tad unusual, very dry and foamy. It's hard to describe, it's almost like the head that you get left with when a keg is running on empty... Despite the head it's an appealing looking lager. Unlike many lagers, Serengeti has a pleasant nose. Crisp grassy hops were very prominent initially before subsiding as the beer warmed up a little. Funnily enough for an all malt beer, the aroma on the whole could be described as "malty". The grains were relatively clean and there was also a hint of caramel. Overall it's a pretty good smelling lager. Serengeti has a really unusual airy, dry head which hangs around for ages and feels funny when you try and drink the beer. Once you get past this the beer is of quite a high quality. It has lots of carbonation without being overpowering and the flavour coming from the malts with just a tiny bit of balance from the grassy hops is very refreshing. Maybe the hops don't provide quite enough bitterness, but they definitely are quality for the little quantity that is in there. How to sum up Serengeti? By no means is this a world beating lager, but I do think it's the best African lager I've had. Some people may be put off by the head, it's really unusual and sort of hangs around for ages, just thins out alot. If you can get past this; Serengeti is a good example of an all malt lager. I'd put it on a par with Cusquena, which is a superb all malt lager. If you're a lager fan it's worth a shot, even if it's just to say you've had a Tanzanian beer.